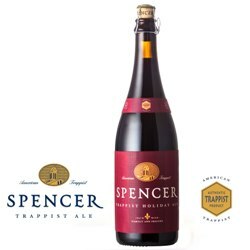 Spencer Trappist Holiday Ale (ABV 9%) pours a deep, hazy mahogany with a creamy beige head. Aromas of sweet malts, dark fruits, and spice carry through to the taste, which is dry and peppery on the finish. A heart-warming feast day ale from the monks' table to yours. 25.4 oz. corked bottle. Jan 15, 2019 | By DON O.